Hello! This is going to be a quick post because my family is waiting on me to go on a bike ride:) I made this for this week's All That Scraps Challenge to make a Box in a Bag. I love these little gift bags and they are so easy to make! 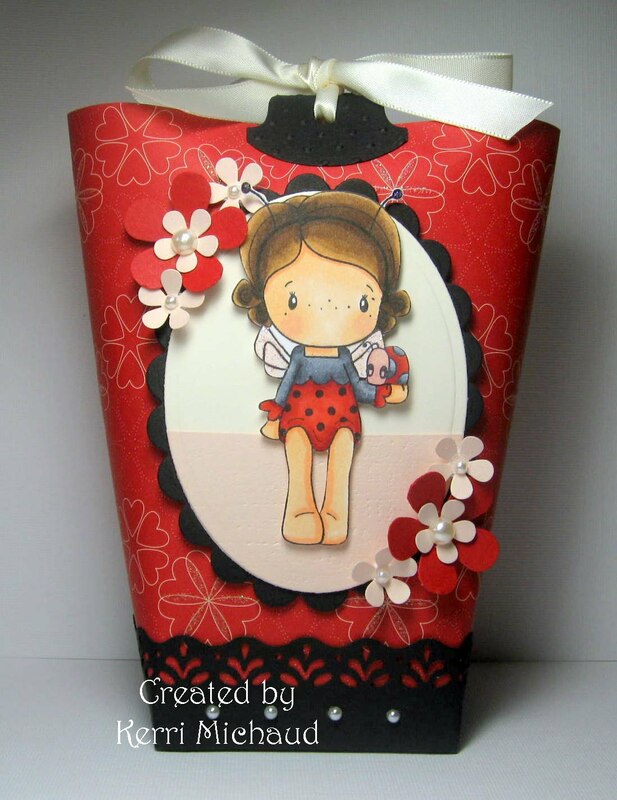 I used this adorable image called Ladybug Nora and some dp from the SU Sending Love Specialty paper pack. Thank you so much for stopping by, and I hope you have a lovely day! So sweet! Love this little lady bug...and your bag is perfect too! Love your little bag, the image is coloured beautifully and so sweet too. You want to know something that I think is funny? I cannot make one of these! LOL I have tried and they always end up in the recycle bin. Yours is fabulous and perfect, of course! What a cute bag! Love this cutie! What a lovely bag Kerri, super cute and wonderful! Adorable, I like these little bags also. I don't know how you make these things - - and I don't care...I just want to admire them - LOL And the coloring on your little girl is fantastic...she's a cutie!